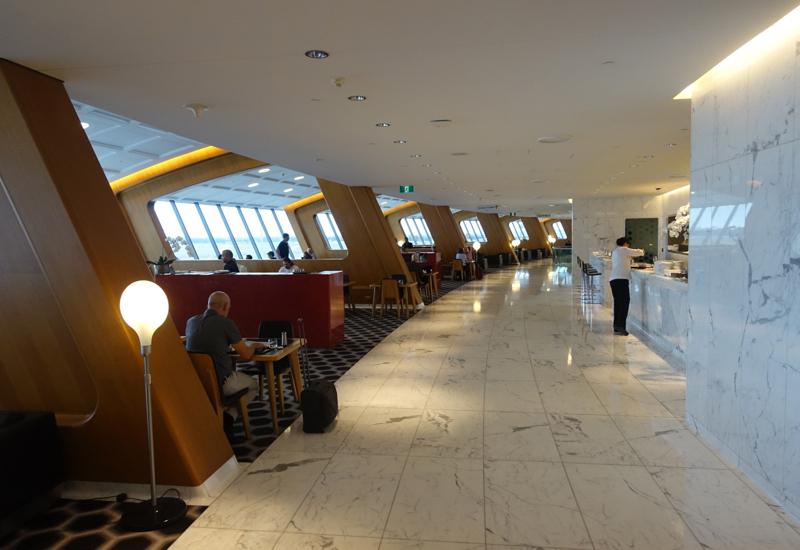 I had read the rave reviews about the Qantas Sydney First Class Lounge, so I was very excited to try it myself. 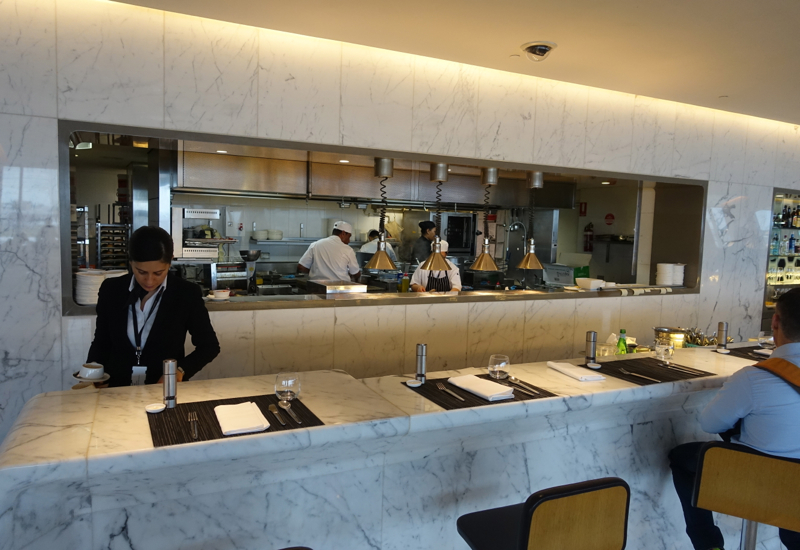 I had a morning flight, and I did not have much time to spend in the lounge, but I was curious to compare my morning experience with the other reviews raving about having lunch and dinner there. 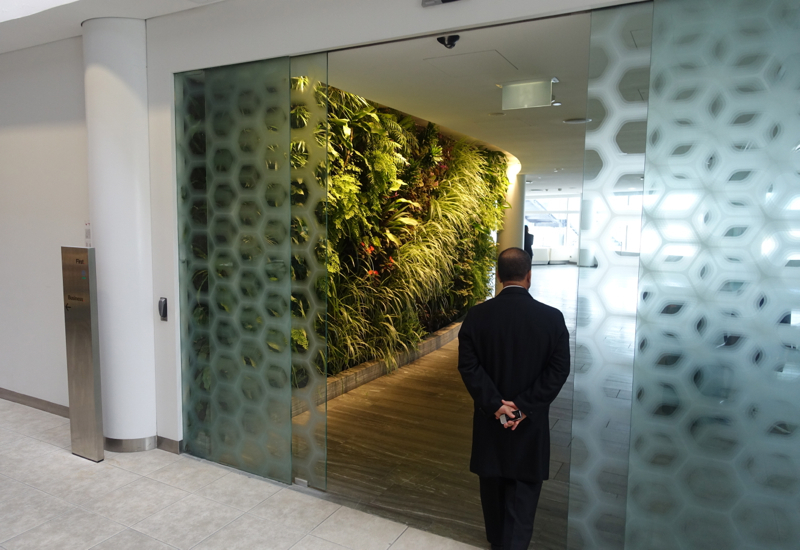 The entrance to the lounge through double glass doors is relatively nondescript, but once inside you hear the relaxing tones of New Age-style music, and notice on your left a long, curving wall covered entirely with real flowers and plants. It was a stunning and unique design choice, and raised my hopes about what was to come. Also, the effect of so much green is instantly relaxing, and quite a relief from the hustle and bustle of the airport. This area is not the lounge itself, but is merely the lower lobby area. After ascending an escalator you reach the main lounge area. With its stylishly sloping lines and contemporary décor, the lounge interior is easily the most vibrant and tasteful design of any lounge I have ever experienced. 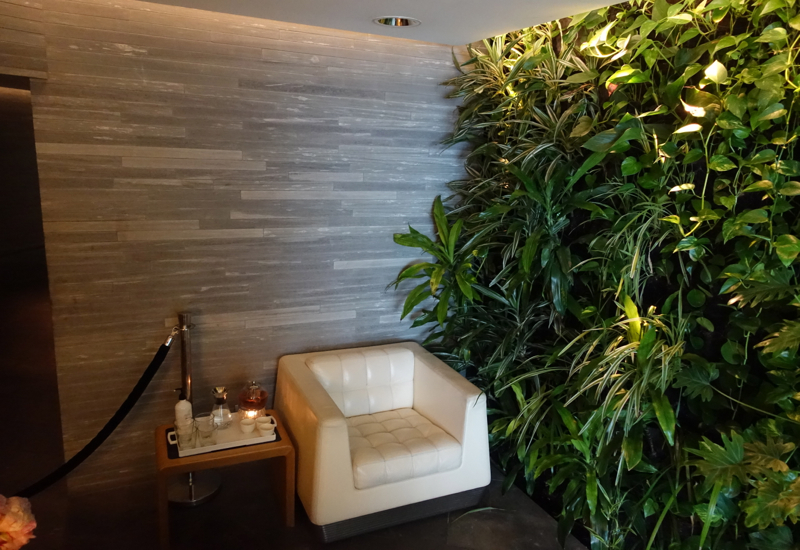 The First Class lounges in the US don’t really have any imagination, and the UAE lounges may be opulent and even breathtaking with so much spaciousness and waterfalls, etc., but for pure aesthetic grace nothing can compare. The seating areas are both intimate and spacious, and the chairs themselves are very comfortable and cozy. 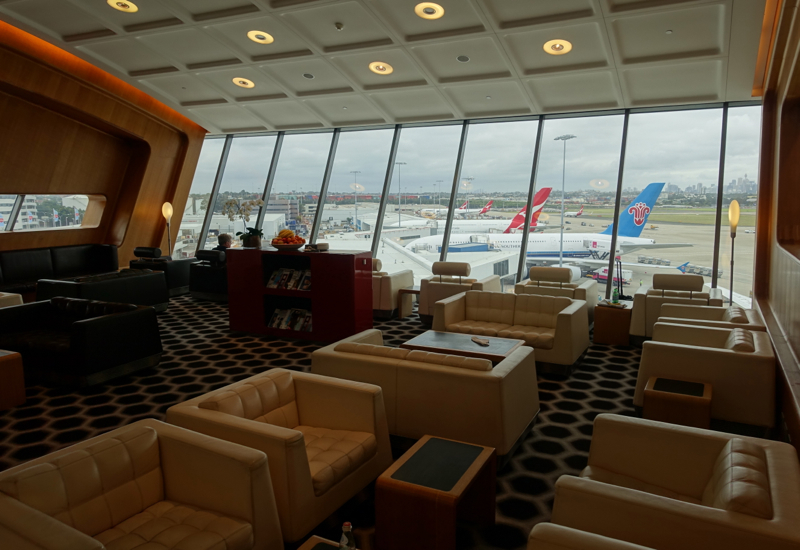 The lounge has an entire glass wall with a view of the tarmac and its moving planes. If you are a plane buff, that is an extra perk, but the natural light is also very refreshing. I could easily see why other reviewers have assigned top grades to this aspect of the experience. 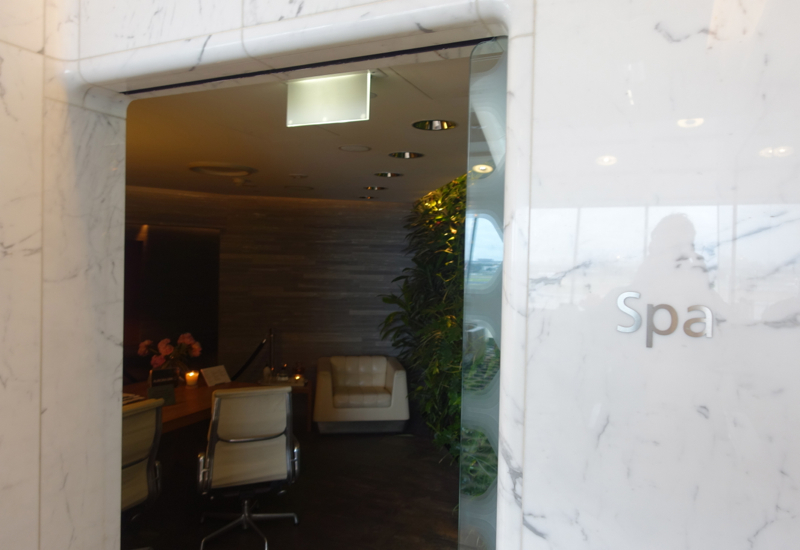 The lounge amenities include a spa area, which was deserted when I arrived for my morning flight. 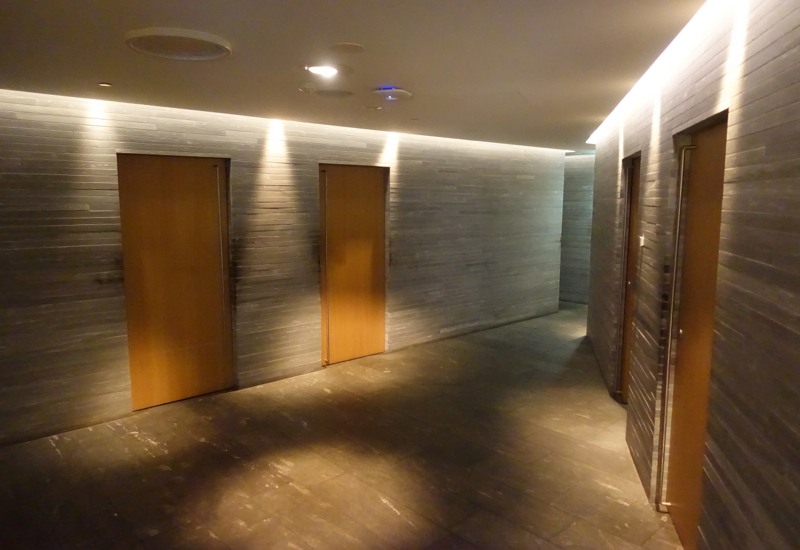 I took a peek inside, and found the interior to be perfectly clean and quiet. I was very disappointed that I did not have time for one of the complimentary 20 minute spa massage treatments, and as there were no staff inside I unfortunately was not able to report on this aspect of the lounge. 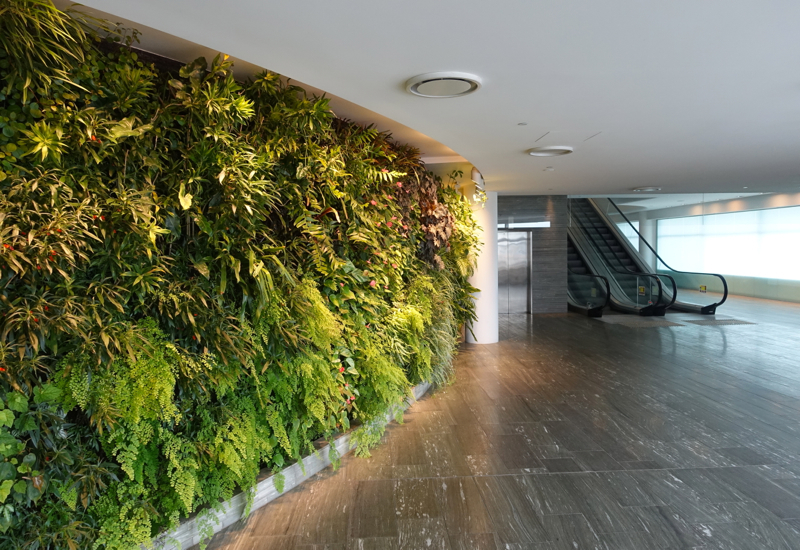 Judging by the other posts I have seen, the spa rooms replicate the lovely “green wall” design of the lower lobby, and so I can only hope I am able to visit Sydney again soon to experience the spa treatments here. 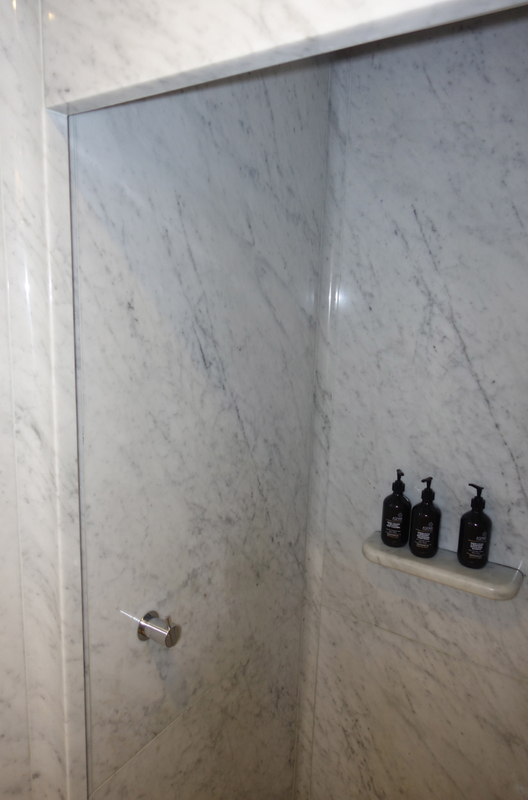 The lounge bathrooms were spacious and clean, and included shower stalls. 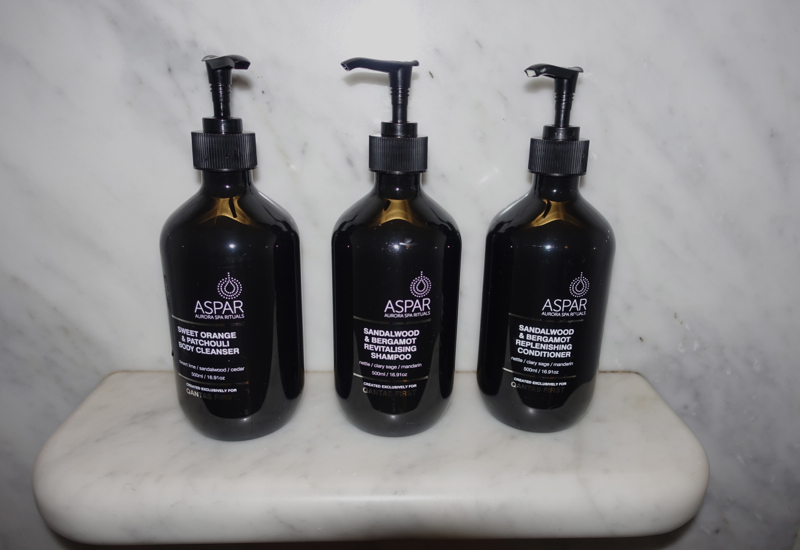 Although I did not need to take a shower having just left the hotel, but I was glad to see that the showers were readily available, as many lounges always seem to have a line. There is no sleeping area in the lounge. In addition to a business center with desks, phones and computers, the lounge also included two very useful private business rooms which could be reserved in advance, or simply utilized if unreserved and unoccupied. The rooms included desks, phones, faxes, television screens, computers and printers, and afforded quiet and privacy if needed. Although the lounge itself was not very crowded, at this early hour most of the occupants seemed to be travelling for business rather than pleasure, and the lounge was also a splendid accommodation for business travelers as well. So this is where my review will depart from the others. At least for breakfast, the Qantas lounge was subpar. I had not eaten anything at the hotel that morning, so I was eager to be seated at the restaurant portion of the lounge. The very pleasant staff member seated me in the café area, but there is also lovely bar seating. 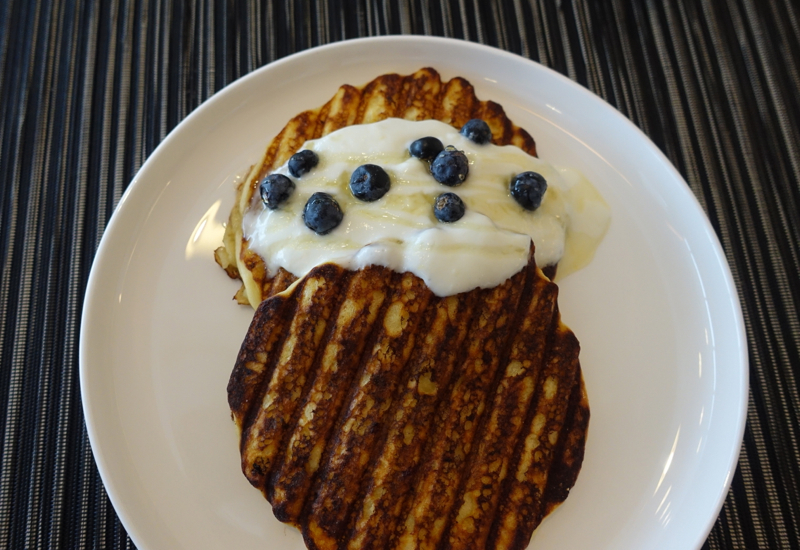 I examined the menu by Australian celebrity chef Neil Perry, which contained a variety of sweet and savory dishes, and chose the pancakes, which came with blueberries and whipped cream. 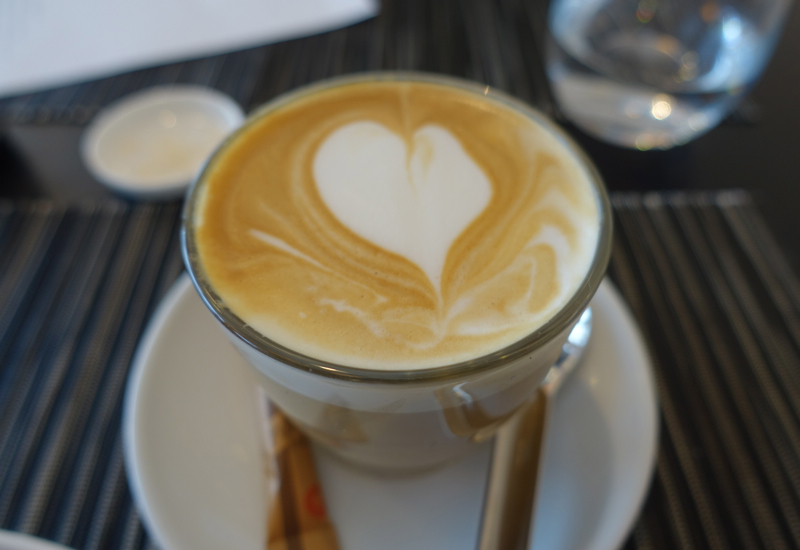 I also chose a café latte, which came with a lovely heart design in the foam. The pancakes and latte were both very mediocre. It is quite possible that the lounge does not put as much effort into breakfast as lunch and dinner, and it is also possible that my menu choice was not indicative of the overall food quality, but any diner in New York could have served comparable pancakes and any half decent espresso bar could have made a similar latte. 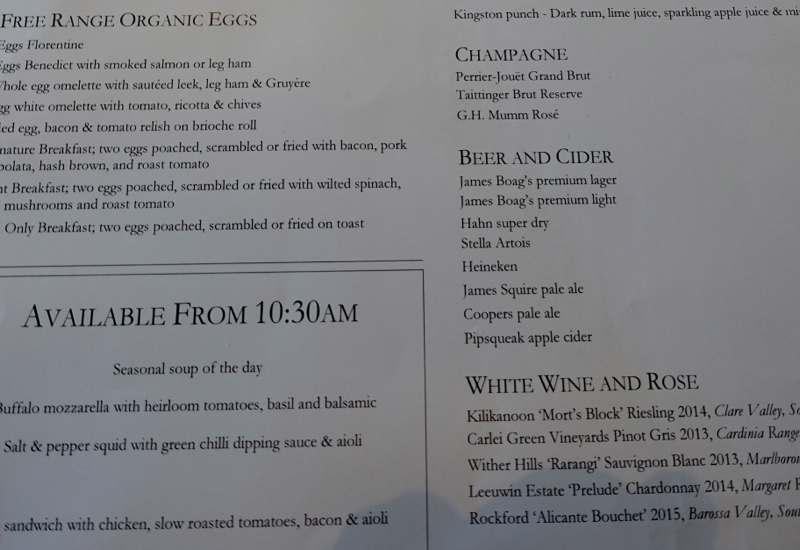 I have also know reviewers have been very impressed with the wine selection in the lounge, but that was not an option so early in the morning. 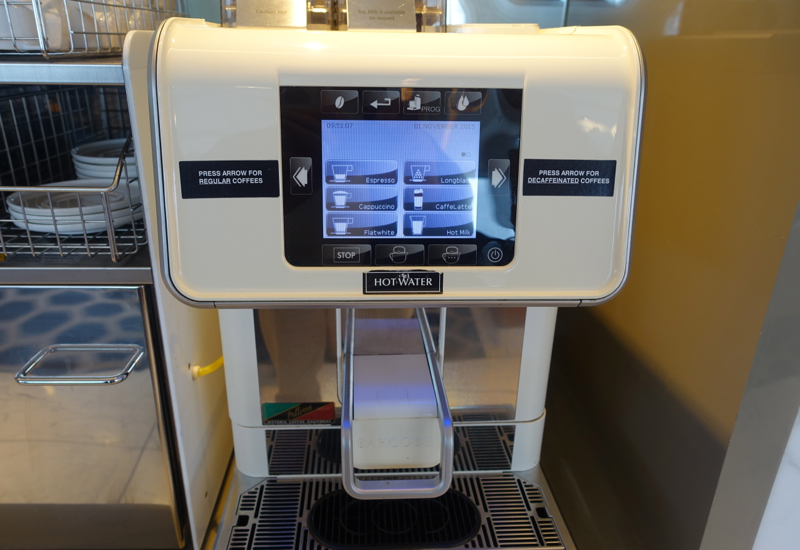 There was a coffee machine in the dining area, and also at this time of day a small selection of yogurt and pastries were available. 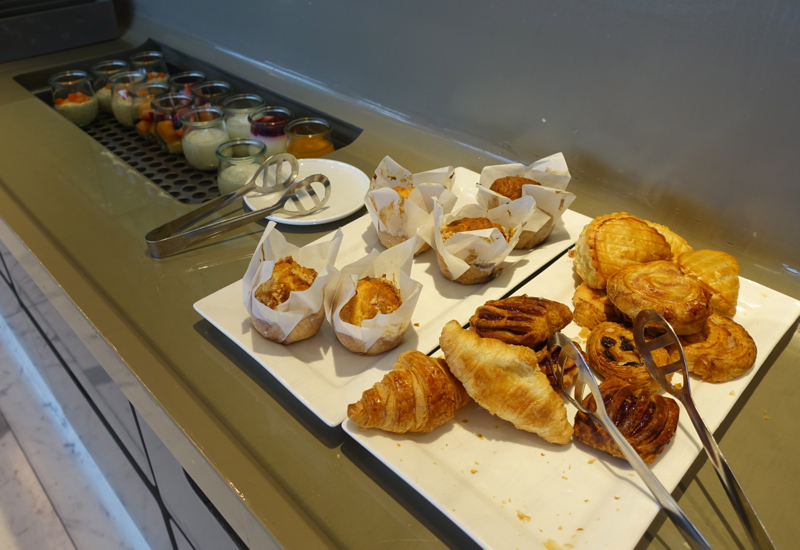 Likewise, these were good enough, but I was somewhat surprised that there not a more robust variety on the buffet, for those not wanting to wait for menu service. 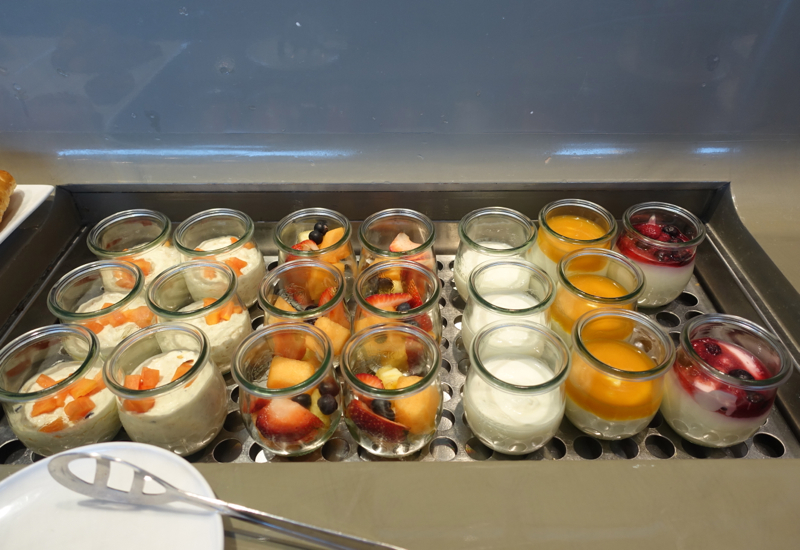 Forget anything resembling an Etihad First Class Lounge buffet spread. The Qantas Sydney First Class lounge absolutely deserves its stellar reputation for design, comfort, and also business amenities. Of course it is not as grand, spacious or multifaceted as the UAE lounges, but it is more intimate and lovely. 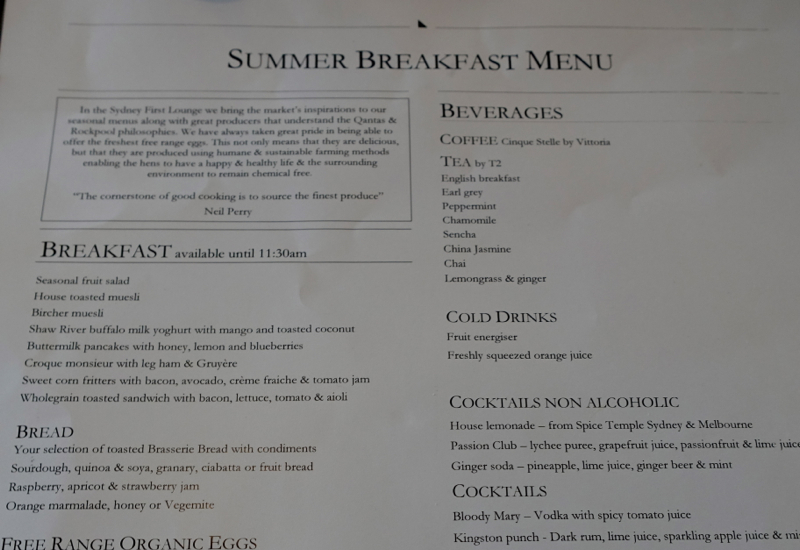 Because I was only there for breakfast my dining experience may not be representative, but I found the food quality to be lackluster, and the selection to be somewhat limited. 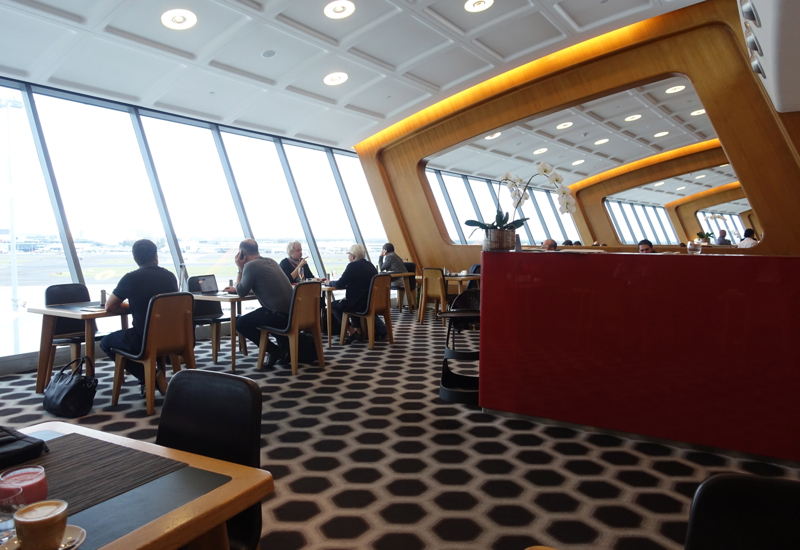 If you've visited the Qantas First Class Lounge at Sydney Airport, what was your experience?